How do I create a shared negative list in AdNabu? 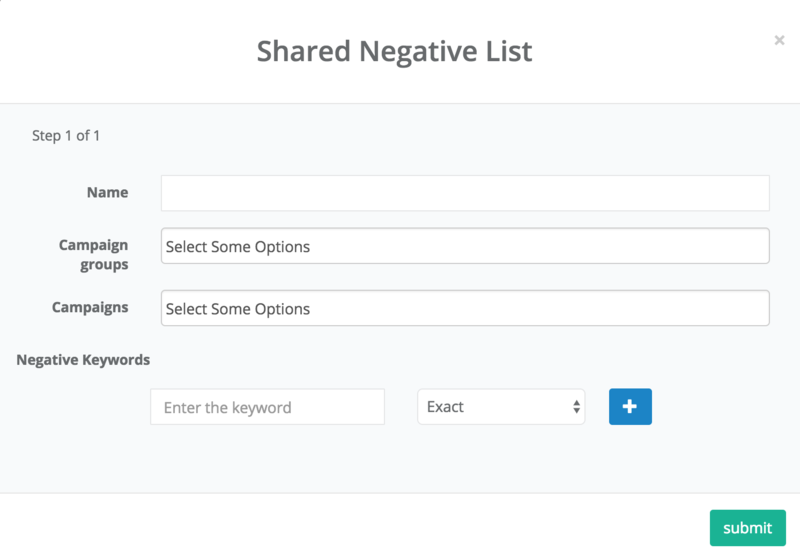 You can create a shared negative list from two places in the dashboard. First you can see the negative lists table in the campaign dashboard. This shows all the lists present in the account. or you can go to a campaign detail page and create one from there. Once you click on create, you will be shown the shared negative list modal. Name - Give a name to the shared negative list which allows you to easily identify the words present in the list. Campaign Groups - Please select the groups where you want to attach the list. This is an easy way of attaching the list to all the campaigns in a campaign group. Please note if you specify the group, you need have to specify any campaigns from that group in the Campaigns field below. Campaigns - Select any campaigns you want to have the keywords excluded from. Negative Keywords - Put all the keywords over. Please enter one keyword/phrase in a box and press the + sign after adding it. Also please specify a match type for a keyword based on the requirements. Phrase - If you want to exclude 'online shopping apparel' also. Better to put the 'online shopping' keyword as phrase. This will exclude both 'online shopping' and 'online shopping apparel'. However it will not exclude it from the 'online apparel shopping' search queries. Broad - To exclude any queries containing the words present in a phrase or keyword, put it as Broad. So if you added 'online shopping' as a broad negative keyword, any search query having both the words 'online' and 'shopping', in any order, will not trigger ads.